You are here: Home > FRSA Conference a big hit! This year the conference was held in Adelaide and hundreds of professionals from across the country flocked to the Adelaide Convention Centre to take part in the three day event. The conference boasted 5 Keynote presentations, 5 facilitated panel discussions, 4 pre-conference workshops and 65 concurrent sessions, offering attendees plenty of opportunities to explore a broad range of topics and issues impacting on the community services sector today. Institute Director, Claire Ralfs, held a pre-conference workshop on implementing the Family Law DOORS risk screening tool, which was well-received by attendees. The Australian Institute of Social Relations also hosted a booth at the conference, offering delegates more information about our training and services and encouraging them to test their cultural fitness knowledge with an interactive competition. The competition saw punters participate in a combined quiz and game of quoits for the opportunity to win a $5,000 cultural fitness training package. “Cultural fitness is a topic very close to our hearts here at the Institute. Our cultural fitness program is for organisations seeking to establish a sound base on which to build and maintain effective working relationships with Aboriginal and Islander clients, families, communities and staff,” said Institute Manager, Iain Henderson. 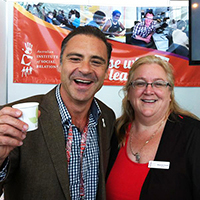 Sharon Lawrence, Educator at the Institute was also lucky enough to snap a picture with White Ribbon Ambassador and FRSA Conference Speaker, Andrew O’Keefe, who is also the host of Australian game show, Deal or No Deal.